No matter how useful your product is, if no one knows about it, no one is going to purchase it. A crucial part of customer acquisition is to get more and more people to know about your products. As modern marketing has grown by leaps and bounds, the audiences have changed as well. We now observe new B2B marketing strategies and tactics emerging every other day. If a business wants to stay on top of its game, it needs to add new methods to its playbook on a regular basis. In this post, we are discussing some of the strategies to increase sales leads for B2B businesses. Publishing quality content is one of the best ways to step-up sales leads for a B2B business. As per a recent survey, businesses that adopt content marketing get 6 times higher conversion rates than non-adopters. Though content marketing needs time and resources, it is a proven strategy to attract and attain good quality leads than traditional marketing counterparts. According to a recent study, more than 73% of buyers referred to case studies while making B2B purchasing decisions. Case studies are crucial for any business, they generate fuel for the fire to get more clients interested in your product or service because it’s measurable proof of what your company does. Detailed case studies explaining how your product is useful and how it solved problems of many business owners can actually help you in attracting new clients. Some channels that should definitely be in your marketing strategy in order to generate leads are email marketing, social media marketing, search engine optimization, paid ads and webinars or events. These channels are powerful alone but they work best if integrated. You should look for ways to guide your audience to your other channels, which would ultimately strengthen their bond with your brand. For example, you may encourage your blog’s audience to have an interaction with you on various social media platforms. To fuel powerful interaction between your brand and your audience, you can also use paid ads on social media to direct people to your blog. You can also conduct webinars or live events to highlight the prime and attractive content of your newsletters, emailers or blog. 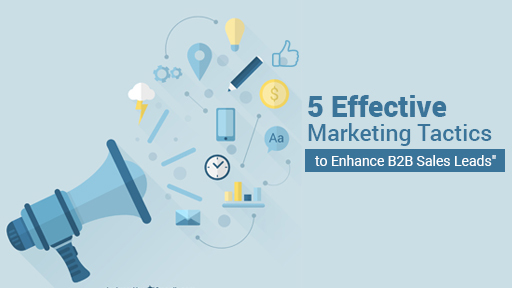 This makes it an ideal marketing strategy for B2B businesses. Before making a buying decision, 87% of B2B decision makers research online to find honest reviews to support their decisions. So, if you want to boost the sales leads by gaining the trust of your potential customers, you need to post reviews of your products and services on your website and other social media platforms available online. Having some testimonials on your portal is a good way to foster trust amongst potential clients. You can reach out to your existing customer base to get some testimonials that you can post on your website. You can also network with influencers and ask them to endorse your product or service. Word of mouth is the most outstanding way to reach potential B2B buyers. Try to engage happy clients to spread the word about your brand. When the word-of-mouth turns into a completed, successful sale, do not forget to reward the valuable clients who put it into action. You can offer a discount on a future purchase or can offer any token of appreciation to motivate the customers. Also, let your other customers know the benefits of spreading the word to their fellow business owners about your products and services.